‘Sicario’ wasn’t a film that immediately cried out for a sequel but the world that it explored at the heart of the drug war on the Mexican border is ripe with possibilities and it is a place I was more than happy to go back to, especially with Taylor Sheridan returning on writing duties. 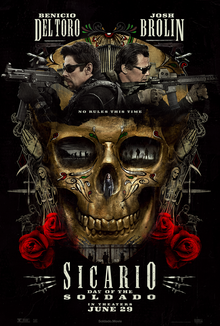 Where ‘Sicario’ was superb, ‘Soldado’ is merely good, but good is fine and I did really enjoy this sequel even as it takes a slightly different approach to the setting. It does lack the surprise element of the first film but as it takes us on another journey (or ordeal is perhaps more accurate) through the murky world of border politics and the drug cartels in Mexico I was hooked. The film is directed this time by Stefano Sollima (replacing Denis Villeneuve who went away to make a small film called ‘Blade Runner 2049’), an Italian director who has been responsible for gritty Italian TV series such as ‘Gomorrah’ and ‘Romanzo Criminale’, alongside the sprawling crime epic ‘Suburra’, one of my favourite films of 2016, and he’s a good match for this material. Josh Brolin and Benicio del Toro return as their characters from the first film and the mission this time centers on the attempts of US high command to start a war between rival cartels without it ever being known that they were the people behind it. Brolin’s Matt Graver is once again tasked with leading the mission, which is kickstarted by a bold attempt to kidnap the daughter of a druglord in a false flag operation. The performances are very good throughout the cast, especially from newcomer Isabela Moner and the film gets at the heart of the conflicting loyalties at play, putting these characters in perilous, tension filled situations. There are no good people here and everyone comes out of the situation with another bit of themselves lost (there’s no innocence on display here, like with Emily Blunt in the first film) as it reinforces the bleak view of a situation where there are only losers and no end in sight. As much as I enjoyed the film I did feel it takes a bit of a leap with a conclusion that felt at odds with the gritty, harsh world these characters operate in, leaning too much into table setting for a sequel, but regardless, I am most definitely on board for whatever comes next.